Though Tron: Legacy is only six months away, the movie's iconic light cycles seem as remotely futuristic today as they did in 1982. 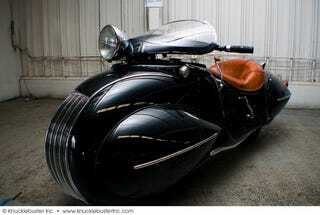 But this custom Henderson motorcycle, built in 1936, is basically Art Deco Tron on Earth. The four-cylinder bike was custom built by O. Ray Courtney in 1936, adapted from a 1930 K.J Henderson, and was recently restored by New Yorker Frank Westfall.